The oscar grows to 30 cm and has a bad reputation for wrecking the decor. Or, less uncharitably, it has plenty of character, and doesn't bother too much about the plants as it barges about. The answer is to use a very large tank (several hundred liters) and tough, well-anchored vegetation. 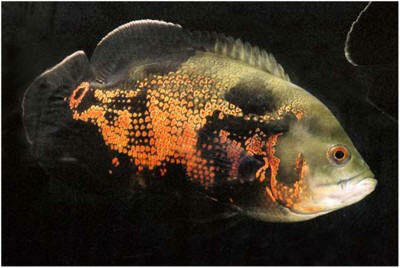 Bronze and gold varieties of oscar have been evolved by artificial selection.